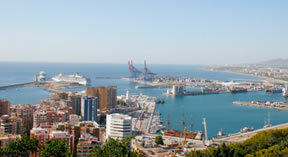 In and around the Malaga area you will find many apartments on hotel rooms offered. It really depends what you are looking for. Most of the costa del sol you should find decent places to stay. If you look for a more busy touristy place you should have a look at Torremolinos. In case you want it less crowded you might want to stay in one of the smaller villages around Malaga for your holiday. In Malaga the most visited places of the city are the cathedral, the picasso museum and the castle de Alcazaba. I personally liked the harbor area also very much. You might plan one or two days during your holidays for a visit. It is really worth it. 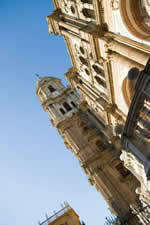 Details about nice sightseeing places in Malaga on our main Malaga page. Depending where you plan to stay on your Malaga holiday, around the Costa del Sol you will find it all. From the hectic and touristy cities of Torremolinos and Fuengirola, with hundreds of apartment and hotel buildings. Or you want to spend some time away from the typical tourist places in villages like Mijas. However, as most tourists come to Malaga to enjoy the sun on their holidays, you will never be disappointed. The excellent Malaga weather allows you to perform nearly every kind of activity. From simple volleyball at the beach or Tennis and Malaga Golf all around the year. Just to mention the Valderama Golf course in the south of Malaga, makes Malaga holidays to a golf player worth a visit. Along the Costa del Sol as far as water sports is concerned nearly everything can be found, from ordinary surfing to sailing and kite surfing. But a nice Malaga holiday is not simply just beach and sports, it’s most of the time party and nightlife. The countless numbers of bars, restaurants and disco along Malaga and the Costa del Sol invite you to spend a perfect holiday.